Exceptional leaders celebrated the Class of 2016 at Barnard's 124th Commencement on Tuesday, May 17, at Radio City Music Hall. 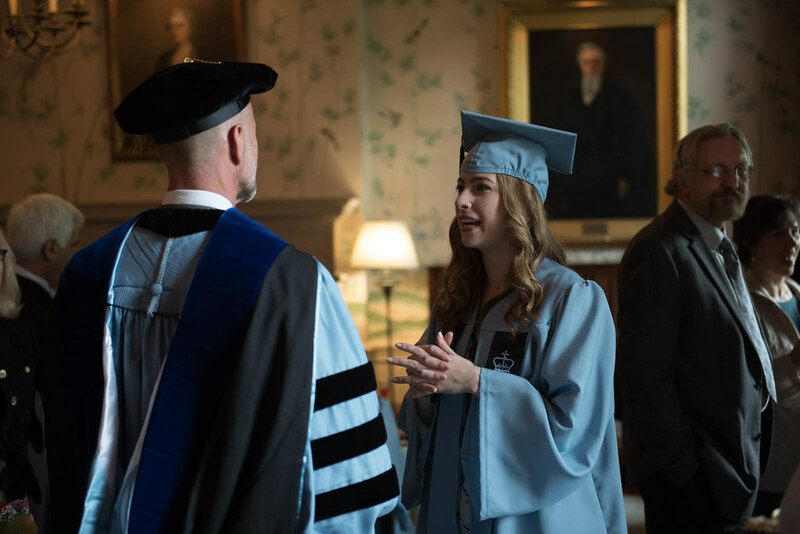 Exceptional leaders who have shaped politics, advocacy, literature, and science celebrated the Class of 2016 at Barnard's 124th Commencement on Tuesday, May 17, at Radio City Music Hall. Anne-Marie Slaughter, president and CEO of New America and Princeton University professor emerita of politics and international affairs, delivered the keynote address before an audience of more than 3,500 people, including Barnard's 618 graduates along with faculty, trustees, staff, family, and friends. Slaughter discussed the nature of contemporary feminism and stressed the importance of coming together. "Caring is at the heart of our humanity," Slaughter said. "Valuing care as much as competition is also vital for an inclusive, intersectional feminism." Slaughter also received the Barnard Medal of Distinction, the College’s highest honor, together with three other honorees: Chimamanda Ngozi Adichie, internationally acclaimed author and 2008 MacArthur Foundation Fellow; Sister Simone Campbell, public policy advocate and executive director of the Catholic social justice lobby NETWORK; and Shafi Goldwasser, MIT professor of electrical engineering and computer science and winner of the prestigious A.M. Turing Award. Read the citations for Adichie, Campbell, Goldwasser, and Slaughter. At a community-wide reception on Monday evening, Sister Simone Campbell discussed the importance of coming together as a community in our fractured political climate, and urged graduates to "take your degrees, take your insights, use them, go to the edge of your creativity, be boldly who you are called to be." Read a transcript of President Spar's speech. Additional speakers included Jolyne Caruso-FitzGerald ’81, chair of Barnard’s Board of Trustees and CEO of the Alberleen Group, and Provost Linda A. Bell, who offered greetings on behalf of the faculty. Senior Class President Deanna Arpi Youssoufian '16 gave the "Charge to the Class of 2016," and was awarded the Frank Gilbert Bryson Prize. Shezza Abboushi Dallal '16 and Taysha Milagros Clark '16 gave reflections on the academic and student experiences, respectively. Senior Fund co-chairs Cinneah El-Amin '16 and Rohini Sengupta '16 announced a senior class gift of $22,000 that will replenish the Bear Essentials Fund, which provides essential items not covered fully by traditional financial aid packages, and cover the cost of repurposed outdoor furniture to be unveiled when the new teaching and learning center is complete.